Published: January 30, 2013 11:56 By Mythily Ramachandran, Special to tabloid! 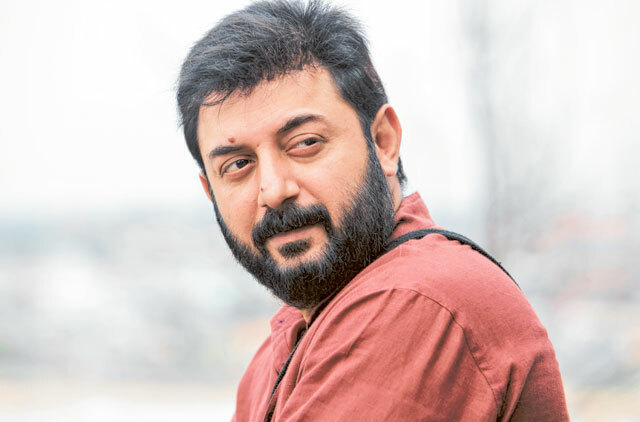 “Just waking up from my hibernation,” reads Arvind Swamy’s twitter profile. Yes, the ‘Roja’ actor, a heartthrob in the ’90s, is back after a hiatus of 12 years. From the trailers of ‘Kadal,’ it appears that Swamy plays a priest. Despite the years that have rolled on since Roja’s release in 1992, the actor still evoked images of Rishi, the cryptologist from ‘Roja. “I quit after ‘Alaipayuthe,’ he tells tabloid!. Swamy also had his business to take care of. Unfortunately, in the next few years he was confined to bed following an accident that resulted in a spine injury. Once he recovered, Ratnam called and suggested they do a film together. “He scolded me, saying ‘you can’t let yourself go like this’,” says the father of two, with a smile. With Ratnam’s motivation, Swamy worked on getting back into shape. “Kadal is a different film, raw and earthy with a complex story. It is a multi-layered story with many dimensions to my character,” says the Bombay star, without revealing much about his character. Is he playing a priest as revealed in ‘Kadal’s trailers? How was it facing the camera after a long break? But on landing on the sets the first day, all self-doubts were ironed out. “I warmed up soon,” recalls Swamy. According to the buzz, Swamy’s performance in ‘Kadal’ has brought offers from other directors. “I have been warmly welcomed on my return to the industry. Yes, there have been offers. I do wish to do something more, but can’t do too many films. I have my business to handle,” explained the CEO and MD of Talent Maximus, India’s largest payroll processing company. Films had never been on his mind, says Swamy. Ratnam saw one of his ads and called him for an audition. Clearing Ratnam’s auditions turned the course of Swamy’s life. On Swamy’s request Ratnam met his parents and the rest as they say is history. Post ‘Roja,’ Swamy went to the US for his Masters in International Business. ‘Bombay,’ was another milestone in his career. Rajeev Menon’s ‘Minsaru Kanavu,’ was a box office hit that won many awards including four national awards. Malayalam film, ‘Devaraagam,’ was another poignant story that exploited Swamy’s talent. With ‘Kadal,’ hitting the screens, is he nervous? Not many know that this businessman and actor is a great cook, a flair he picked up from his family cook as a little boy. “For my children I prepare continental dishes,” reveals Swamy. When time permits, he enjoys painting and playing chess, a game he learnt from his mother during childhood. But his daughter happened to watch ‘Roja’ on TV. Kadal releases in the UAE today.